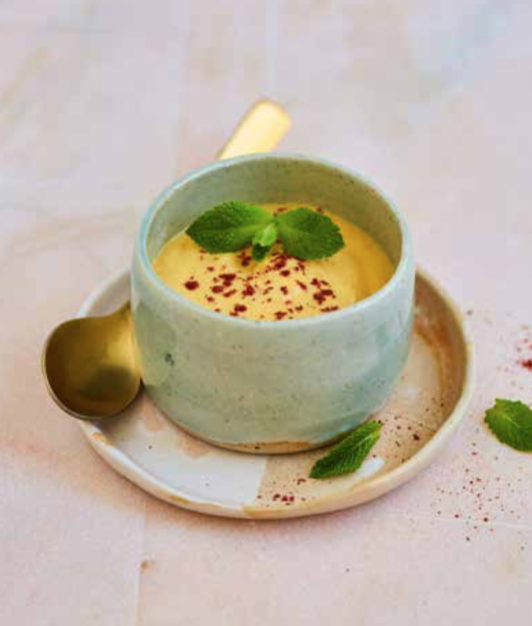 The warmer days are such a perfect time to enjoy a little something sweet — my light and airy mango lassi mousse from East by West (page 88) hits the spot, while still nurturing your digestive fire (Agni). Ayurveda typically advises us against having fresh fruit with dairy, but this recipe uses dried mango, so it will go down a treat! Soak the mango pieces in the water until soft. Remove the pieces from the water and reserve 50ml of the soaking water. Blend the reserved water and mango with the yoghurt for 5 seconds until smooth and whipped, then mix through the lemon zest and turmeric, if using. Top with the sumac and mint leaves and serve at room temperature. TIP: Save the leftover soaking water to add a little sweetness to dals and stews.